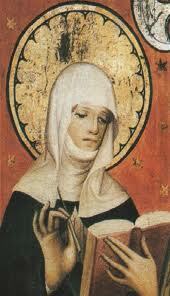 St. Bridget of Sweden. You can learn about her here. Glory be to you, my Lord Jesus Christ, for the mockery you endured when you stood clothed in purple and wearing a crown of sharp thorns. With utmost endurance you allowed vicious men to spit upon your glorious face, blindfold you and beat your cheek and neck with cruelest blows. Praise be to you, my Lord Jesus Christ. For with the greatest patience you allowed yourself like an innocent lamb to be bound to a pillar and mercilessly scourged, and then to be brought, covered with blood, before the judgment seat of Pilate to be gazed upon by all. Honor be to you, my Lord Jesus Christ. For after your glorious body was covered with blood, you were condemned to death on the cross, you endured the pain of carrying the cross on your sacred shoulders, and you were led with curses to the place where you were to suffer. Then stripped of your garments, you allowed yourself to be nailed to the wood of the cross. Everlasting honor be to you, Lord Jesus Christ. You allowed your most holy mother to suffer so much, even though she had never sinned nor ever even consented to the smallest sin. Humbly you looked down upon her with your gentle loving eyes, and to comfort her you entrusted her to the faithful care of your disciple. Eternal blessing be yours, my Lord Jesus Christ, because in your last agony you held out to all sinners the hope of pardon, when in your mercy you promised the glory of paradise to the penitent thief. Eternal praise be to you, my Lord Jesus Christ, for the time you endured on the cross the greatest torments and sufferings for us sinners. The sharp pain of your wounds fiercely penetrated even to your blessed soul and cruelly pierced your most sacred heart till finally you sent forth your spirit in peace, bowed your head, and humbly commended yourself into the hands of God your Father, and your whole body remained cold in death. Blessed may you be, my Lord Jesus Christ. You redeemed our souls with your precious blood and most holy death, and in your mercy you led them form exile back to eternal life. Glory be to you, my Lord Jesus Christ. You allowed your blessed body to be taken down from the cross by your friends and laid in the arms of your most sorrowing mother, and you let her wrap your body in a shroud and bury it in a tomb to be guarded by soldiers. Unending honor be to you, my Lord Jesus Christ. On the third day you rose from the dead and appeared to those you had chosen. And after forty days you ascended into heaven before the eyes of man witnesses, and there in heaven you gathered together in glory those you love, whom you had freed from hell. Rejoicing and eternal praise be to you, my Lord Jesus Christ, who sent the Holy Spirit into the hearts of your disciples and increased the boundless love of God in their spirits. Blessed are you and praiseworthy and glorious for ever, my Lord Jesus. You sit upon your throne in your kingdom of heaven, in the glory of your divinity, living in the most holy body you took from a virgin’s flesh. So will you appear on that last day to judge the souls of all the living and the dead; you who live and reign with the Father and the Holy Spirit for ever and ever. Amen. This entry was posted in Saints and tagged Catholic, Mystics, Saints, St. Brigid of Sweden. Bookmark the permalink.